A common question that an estate planning attorney gets asked is how to obtain a copy of a deceased person's last will and testament or other probate court filings. Since probate records are public court records that anyone can read, if a will has been filed for probate, then you should be able to obtain a copy of it. With modern technology comes the ability to locate information about a deceased person's estate online, and in most cases for absolutely free. 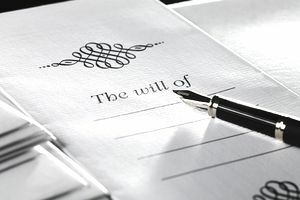 While you may not be able to view copies of the actual will and other documents that have been filed with the probate court for free, at the very least you will be able to see a list of the documents that have been filed, who has been named as the executor of the estate, which attorney the executor has hired, and the name of the judge presiding over the case. Some courts even list the names of all of the beneficiaries of the estate. This will then give you the ability to request copies of the will and any other documents you are interested in viewing from the probate clerk's office, or you can try contacting the executor or the executor's attorney for additional information. An estate is probated in the county where the deceased person lived at the time of his or her death, or, in some cases, the county where the deceased person owned real estate. Use the following website to locate the correct name of the county by plugging in the name of the city where the deceased person lived or owned real estate: City - County Search. Once you have located the appropriate county, an online search can be done for that county's probate court or probate court dockets. This can be tricky because in some states the probate court is not actually called the probate court, it could be referred to as the "circuit court," "surrogate's court," "orphan's court," or any other number of courts. Be persistent - since probate occurs in each and every county across the country, chances are you will be able to locate the appropriate court's online information. Appearing in person and asking for a copy of the will or other probate documents, or making a written request by fax or mail if applying in person is not feasible. Paying a copying fee for the number of pages that the will or other probate document contains. These fees usually range from $1.00 to a few dollars per page. Providing a self-addressed, stamped envelope for mailing the copies if the request is not made in person. If the estate you are interested in is being probated in the Seminole County Circuit Court located in Sanford, Florida, then this county does not currently have its probate dockets available online. Instead, you will need to call the probate department of the Seminole County clerk's office at (407)665-4328 and ask them about their procedures for obtaining copies of probate court records and the costs involved. The clerk's website can be accessed by following this link: Seminole County Clerk of Courts. If the decedent lived in one of these cities or owned real estate located in one of these cities, then contact the Seminole County clerk's office as indicated above.